Here's the market report for Roanoke and 76262 area as of April 2019. As we head into April 2019 I wanted to give an update on current market conditions. As we head into spring, this is the time that a lot of people are thinking of selling their home and so sellers and buyers need to be aware of what the market is currently doing. In the first chart, I want to highlight months. As you can see in the chart, we're currently at 2 months inventory. This indicates that we are still in a strong sellers market in Roanoke. 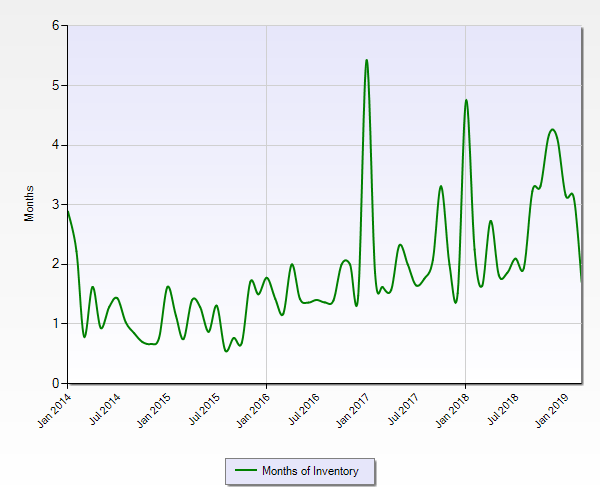 There's been periods in the last several years when we've been below 1 month inventory; that was an insane time for the current market when homes would be listed and immediately have multiple offers. It's cooled off a little since then, but it's still a very hot sellers market. The DOM or the average Days on Market is slightly over 30 days. This means for the average house that gets listed, it's going to take a little over 30 days for it to go under contract. In this next chart, I'm showing what the average sales price has been in Roanoke over the last 5 years. As you can see in the graph, in early 2014 the average sales price for a home in Roanoke was a little over $200,000 and now in early 2019, the average sales price is a little over $300,000. $321,821 to be exact. That's about a 50% increase over the last 5 years. That's pretty significant for our market. What we've seen in increased home values since 2012 has been unprecedented. The outlook for the coming months in 2019 is for the very low months of inventory to continue and that means we'll continue to have a real shortage problem in the amount of housing available. Because of the law of supply and demand, this will continue to drive home values up more and more in the coming months in Roanoke, TX. Are you thinking of selling your Roanoke TX home? If you are, you can request a FREE market analysis from me and I'll show you exactly how much your home is worth and how to maximize your home's value. You can request your free market analysis here.